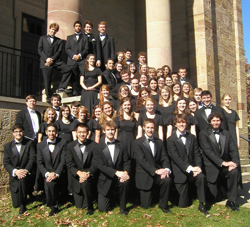 The parish Web site hasn’t made much of the event, but tomorrow night’s concert by the Kenyon College Chamber Singers should be well worth attending. It takes place in the church Saturday, March 5, 2010, at 7:00 PM. Contrary to what was announced at the beginning of the program year, this is not a joint concert with our own choir, but just a concert by the Kenyon group. The choir is substantial, by the way. According to its Web site, there are 43 male and female singers. The announcement by St. Paul’s puts that number at 55, which is likely correct, since we have had to find overnight accommodations for the singers! The concert is the last one of the 2010–2011 season of the Friends of Music Guild.